As for the unrestricted access part though, the way it's presented it seems suitably unconditional(!!) and in Perú desperately needed. I wrote in December last year that Telefónica being the hero of the day has both GB download limits and simultaneous connections limits per household in Perú. Download caps were at the time set to between 20 and 60GB/month, and number of simultaneous TCP-connections to 200. I asked around a bit about this, but have as yet not found out whether or not 200 TCP-connections per moment could also be made to apply to UDP. It depends on how the amount of connections are monitored, apparently. I am cautiously optimistic. Remember that Chile approved a net neutrality law last year that conditioned the unrestricted access on "legal activities". Sounds more like "Para siempre" as in "for the rest of eternity" ;) . But I am well aware of the possible association you are hinting at, my dear leftie ;) . If I read between the lines, it sounds like the state (and thus the people) is going to pay for increased public investments in IT infrastructure (from the state budget, and thus taxes)... and the people receive unrestricted and costless access to the services provided with it. This may prove a better election argument in a country with more IT awareness than where most people have yet to discover a keyboard. It sounds like old-style soviet propaganda ;) . @Ningún Otro: Because the IT awareness is very low I strongly suspect that Telefonica has a part to play in this. Leftist regimes are generally not prepared to throw citizens to the commercial wolves in the belief that this is good and juste, but they sometimes accidentally do it anyway because they believe they're doing the right thing (as in, while they're trying to make everything better they accidentally create a tiger on stereoids because the tiger said that giving it stereoids would surely improve things vastly for everyone). if they're public investments suggested that's actually not much worse from Finland, where they have plans to get 100 Mbit symmetric connections (I think) to all Fins (including rural ones) starting 2015 (up to 66% public subsidies for the infrastructure investments). "no solventara" sounds like they /don't/ have to invest though. maybe i'm misjudging south american regimes when i believe that "something not being of th concern of someone" means they have to invest (with public money=of the public)? As UDP is connectionless counting "number of simultaneous connections" would only yield nonsense information. @Jan-Olof: Okej. 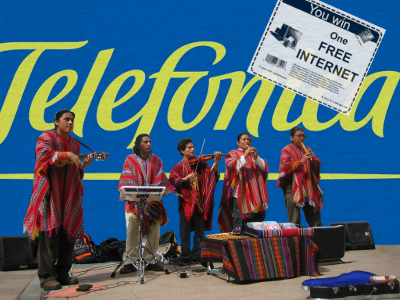 To my best of understanding it will be a while before Telefónica destroys encryption in Peru then. "no solventará" means... wil not bear the burden, pay the cost, etc. Totally in line with the fact that they seek to pay for it all by establishing a levy to be paid by the companies that exploit the infrastructure (including those that distribute cable TV). Not something Telefónica might really like as being probably the biggest... they will have to cough up the lions part ;) . Worse... Telefónica is the one who is going to pay most... to fund the construction of more TI infrastructure that will be not property of Telefónica... so that the share of their property in the total TI infrastructure of Peru will go gradually down ;) . Telefónica owns the most of the infrastructure just now, so if there's going to be a tax on using infrastructure, Telefónica must be made to pay taxes on its own infrastructure since that's the infrastructure available. If the Peruvian state is not going to tax Telefónica for using its own infrastructure there is not much infrastructure to tax Telefónica for.